Peach trees are a popular fruiting tree for the home orchard. However, peach trees are short-lived and are susceptible to a variety of insect pests and fungal diseases. 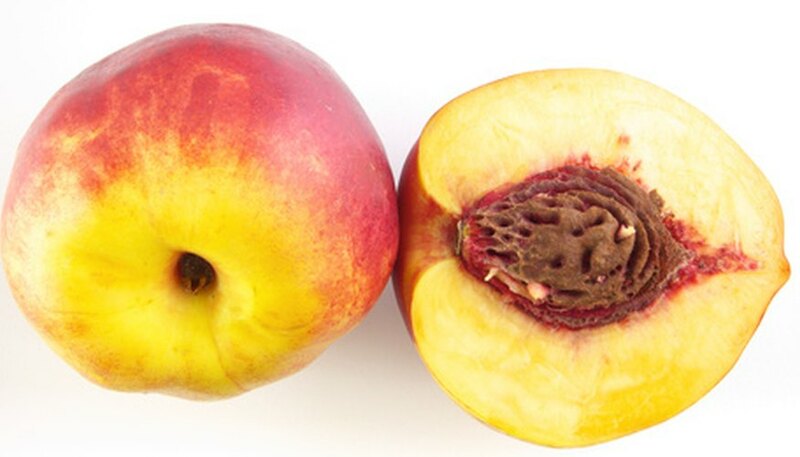 In order to have a productive crop of peaches, a peach orchard or single peach tree needs specific care to stop common peach tree problems from developing. For example, a good pruning program and good sanitation go a long way toward preventing many diseases that start from poor air circulation or from old fruit left laying on the ground. The most important thing you can do to keep a healthy peach orchard is to contact your local county agricultural extension office and ask for information on spraying fruit trees in the home garden. San Jose scale spread from the San Jose California area in the late 1800s after it was imported on flowering fruit trees. In the immature stage, San Jose scale is a tiny insect that attaches itself to the limbs or fruit of a peach tree. Then, it begins sucking the sap from the tree and secretes a gray waxy substance over its body. This waxy substance protects it from predators and pesticides making it difficult to control. Spray with a pesticide specific to scale insects at the right time each year. Follow directions on the label carefully, as you may need to spray more than once per year. Spray for scale in the winter and again in the spring just before buds begin to swell. Plum curculio is a destructive pest of peach, plum and apple trees. The female beetle feeds on the ripening fruit and leaves a distinct half-moon shaped mark where she feeds, then lays her eggs. The eggs hatch and the larvae eat their way into the ripening fruit eventually causing the fruit to fall to the ground. Once the fruit has fallen, the larvae burrow into the ground, eventually turning into a beetle and climbing back up the tree the next season and restarting the cycle. Proper timing of a spray specific to plum curculio is important as the window of opportunity for control is only a few days in the spring. Spraying should be done right after petal fall so you don't kill bees and again as fruit begins to form. For best results, follow the timing schedule obtained from your local country agricultural extension agent. The timing is different in different parts of the U.S. The moth of the peach twig borer overwinters in the crotches or bark crevices of a peach tree where she lays her eggs. The eggs hatch and the small worms crawl up the branches to attack new leaf sprouts and flower buds. They eventually work their way into the branch and the branch will die back to the point of the invasion. Once again, timing of the spray period is imperative to control this pest. Spray during the winter to kill the moths overwintering in the branches. However, because approved pesticides and application rates can change from year to year, consult with your local country agricultural extension office. Brown rot overwinters on old fruit that is left on the tree or laying on the ground. It appears as a virulent fungus on fruit and is frequently seen girdling the limbs above the fruit. Wind and water carries the spores to new fruit where it can grow and destroy fruit in a short amount of time. Orchard sanitation is very important to prevent brown rot and other fungal diseases. Also, a regular spraying program that is specific to fungal diseases needs to be done twice a year--once in the spring after petal fall and again after the fruit forms. Be sure to follow the instructions obtained from your local county extension agricultural agency because the approved fungicides and the frequency of application can change from year to year.